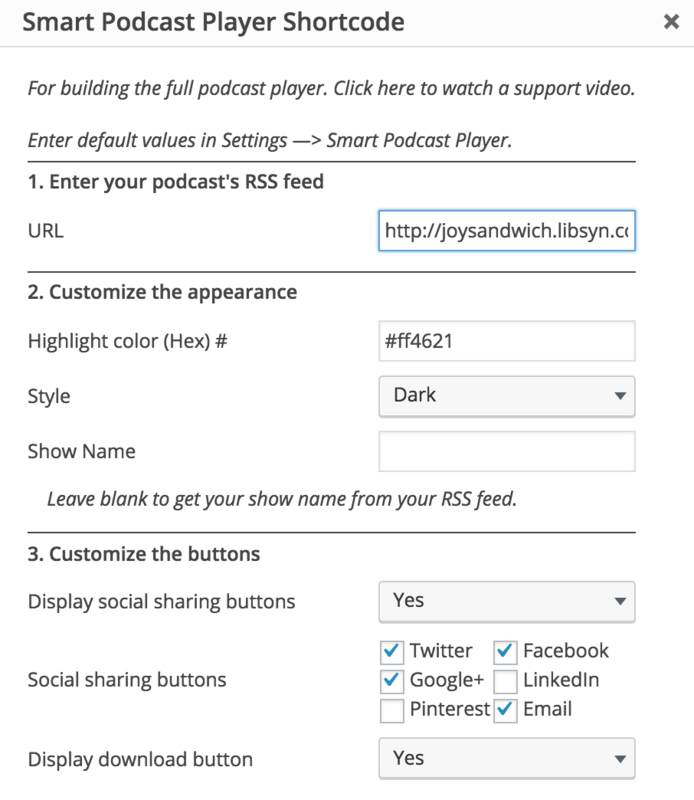 We add the podcast players into our pages/posts using a shortcode. Watch the video to learn how. If you don't see the visual editor tab, read this article. To create your shortcode, find the place in your page where you would like to insert the player. Go to the Visual tab in your editor. Click on the green SPP button in the editing tools. This will pop up a box with fields you can edit. Now, if you’ve properly set up your Player Defaults, as we did in the previous video, you don’t have to edit any of these fields. You can just click OK. This will add into your post the shortcode [smart_podcast_player]. When you preview your post, you should see a full Smart Podcast Player here, using the RSS feed that you have in your Player Defaults settings menu. Note: if you don't have an RSS feed specified in your Player Defaults menu, you'll need to add it manually when you build the shortcode. We'll look at that next. Let's examine each item in the shortcode builder. Any values you enter here will override what you have entered into your Player Defaults menu. URL: You can override the RSS feed in your Player Defaults menu by putting a new one in here. Most of the time you’ll leave this blank. Style: Choose whether your player uses the light or dark theme. Learn more about this here. Show Name: This will override the Show Name you specified in your Player Defaults menu. Learn more about this here. Customize the buttons: Switch this to Yes if you want to show social sharing buttons. 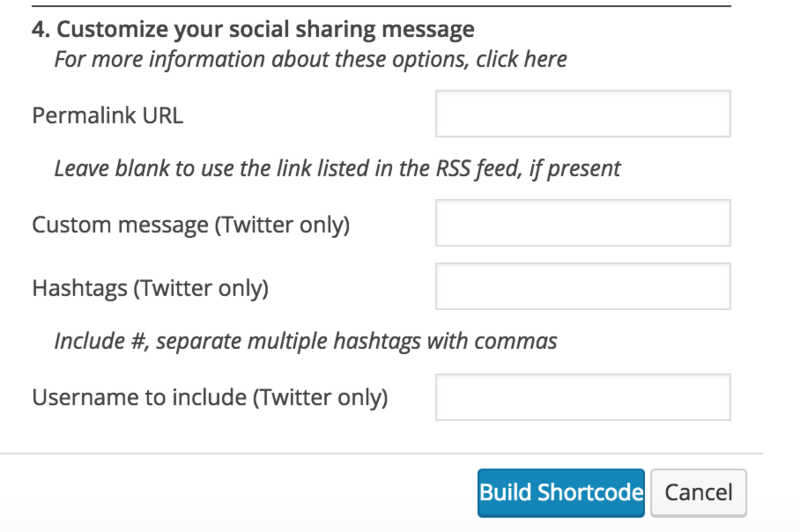 Pick your social sharing buttons you want listed. Display social sharing buttons: Switch this setting to No to remove the social sharing buttons from your player. Customize your social sharing message: Pick a permalink URL you want people to share when they share on social media from your player. Add a custom message and hashtag for Twitter. Add a username for Twitter too! Display download button: Switch this setting to No to remove the download button from your player. There are several other attributes that you can manually adjust. Visit the Player Customization section of the support library at support.smartpodcastplayer.com.